Dr. Harish Shah has done M. Sc in Clinical Dermatology from Saint John's Institute of Dermatology, Saint Thomas's Hospital London (UK) in 1991. He also holds a Diploma in Clinical Dermatology from Cardiff, Wales, which he attained in 1990. He has worked as a Registrar in Department of Dermatology in Saint Thomas's Hospital London for 2 years. Later he worked in Government Lady Reading Hospital, Peshawar, Pakistan as a consultant dermatologist for 3 years. 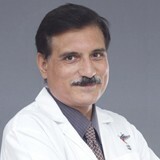 He joined NMC Healthcare in 1996. He takes special interest in paediatric dermatology and has over 20 years’ experience in cryosurgery for the treatment of benign and malignant skin tumors. He is Member of European Academy of Dermatology and regularly attends meetings of European Academy twice a year for the past 13 years. Dr. Haris Shah is well versed in Hindi, English, Arabic, Urdu and Pushto.